To America I Say, 2002, b/w, 5:20 min. Opening RKO production title of the movie �?King Kong�? 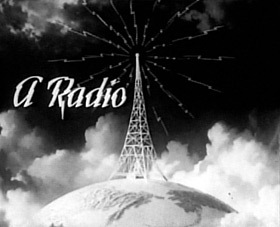 (1933), shows a radio antena as it transmitts a Morse coded message. One hears a typical series of short and long beep-sounds and on the background of the globe a title of the production is being written. The series of sound impulses read as: �? ?VVV A RADIO PICTURE VVV�?�. By re-editing this sequence a slightly longer and different opening title of a movie is created and a new message is inplanted. Now the RKO radio tower sends a coded message by Osama bin Laden to America immediately after the attack on the World Trade Center towers in New York.